Nearly 200 women gather in Phoenix for extensive training, mentoring and networking with experts on business ownership. The program, an initiative of the Institute for Veterans and Military Families (IVMF) at Syracuse University, in cooperation with the U.S. Small Business Administration (SBA), helps women veterans and military spouses unearth their passions and learn the necessary business skills to turn their ideas into thriving business ventures. Along with the SBA, the three-day training conference is sponsored by USAA, with additional support from thinkThin, and Newman’s Own Foundation. This training follows three weeks of focused online instruction. Coupled with a strong mentoring and support networks, participants leave armed with the tools to navigate the challenges of business ownership. This is critical in creating sustainable ventures. Brigadier General Margaret Burcham (U.S. Army, Retired), the first women promoted to the general officer ranks in the U.S. Army Corps of Engineers, recently transitioned to the private sector and is the Founder and CEO of Athena Global Strategies, LLC. Major General Angela Salinas (U.S. Marine Corps, Retired), Chief Executive Officer, Girl Scouts Southwest Texas, who was the first Latina selected and promoted to the general officer ranks in the U.S. Marine Corps. Kaney O’Neill, a U.S. Navy veteran who served on the nuclear aircraft carrier U.S.S. Nimitz, and was paralyzed from a spinal cord injury. She is the owner of ONeill Contractors, Inc., which competes in the construction field performing general contracting and roofing services. Jackie Robinson-Burnette, Deputy Associate Administrator, Office of Government Contracting & Business Development Headquarters, U.S. Small Business Administration. Information on the V-WISE conference . For additional information about V-WISE program. Read success stories from V-WISE program graduates. 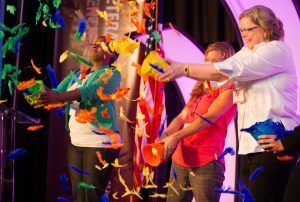 The Veteran Women Igniting the Spirit of Entrepreneurship (V-WISE) program provides women veterans with the tools to become successful entrepreneurs. Attendees of the V-WISE program receive in-depth instruction from prominent business owners, leadership consultants, educators, veterans and other experts who help shape their development as entrepreneurs in the areas of accounting, business law, business planning, finance, government contracting, human resources, marketing and technology. Created by the Institute for Veterans and Military Families (IVMF) at Syracuse University and the Martin J. Whitman School of Management at Syracuse University in partnership with the U.S. Small Business Administration (SBA), the program has impacted more than 2,000 women veterans and military spouses from all service branches and eras with more than 65 percent of V-WISE graduates starting or expanding a business. V-WISE graduates have generated over $41 million in revenue. For more information on V-WISE and its graduates, visit vwise.org and follow the V-Wise program on Facebook and Twitter.